Yesterday, I ran across Cyber Cossack’s recent post that sounded too bad to be true — until I saw what I saw. As you can see, the post-Soviet reality has somewhat eluded Frommer's, one of America’s best sources on travel. Click here to view the original map displayed on the site. Some numbers indeed have remained quite stable during the last 50 years, though. While Europe on 5 Dollars a Day is a relic of the past, Ukraine on 5 Dollars a Day is the lot of millions of Ukrainians. Appearing but unlabelled (apparently because there are no “travel opportunies”, i.e., tours, in that country): Latvia, Lithuania, Slovenia, Albania. Well, I guess, Ukraine is a slightly different case. The absence of travel opportunities could account for such “unidentified” countries as Latvia and Lithuania, which are shown as blank spaces with set borders. Instead, we have a big Russia: a red space whose borders match the Soviet Union’s, less the Baltics. Which makes this map ubber strange: the U.S. recognized Ukraine’s independence on Dec. 25, 1991, a mere three months after it reestablished diplomatic ties with the Baltics. 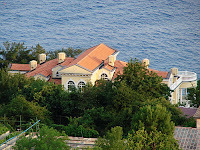 It all began with the media being curious about Lutsenko’s recent vacation on Crete, where he stayed at a luxury hotel. Responding to inquiries, Lutsenko stated that his household income, to which, he said, his wife, Iryna, had contributed as much as $100,000 last year, allowed him to do so. Ukrayinska Pravda decided to dig a little deeper. After probing Lutsenko on his wife’s employment in a rather tense and uncooperative phone conversation, Ukrayinska Pravda learned that the firm that employs her as CFO is Українські новітні телекомунікації (Ukrainian Novel Telecommunications). UNT turned out to be a family business run by Lutsenko’s close relatives, Yuriy and Olena Voskoboinikov, who hail from Lutsennko’s home oblast of Rivne. But wait until you hear this. Further investigation revealed that UNT, an auxiliary wireless service provider, may have profited from its ties to Lutsenko during his term as Minister of the Interior. Several documents suggest that, as Minister of the Interior, Lutsenko may have assisted UNT in securing a contract with the Ukrainian government. It remains unclear, though, whether they actually made a deal. UNT was supposed to boost communication capacity for law enforcement and to lower its costs, operating as an extension of MTS (then UMC), Ukraine’s second largest wireless company. The savings strategy appears to have extreme proportions: UNT does not have a Web site, nor does it have a decent office. Damn it, Yura, is that true? If so, then we have a raging conflict of interest on our hands. Lutsenko, who ranks second in the pro-presidential NU-NS bloc, denied the allegation Thursday and accused Ukrayinska Pravda of character assassination. 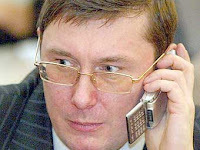 UP, in turn, welcomed Lutsenko to settle the issue in court. Cherno to Get a Slot on the Reg List? For Leonid Chernovetsky, Kyiv’s most unpopular mayor in well over a decade, reelection chances run low. Now that he’s given Kyivites a little taste of what it’s like to trade votes for vermicelli, repeating the 2006 score of 31.26 percent seems a tall order. "Але якщо він виявить таке бажання, це буде досить вдалий варіант і для нас, і для нього". "Леонід Михайлович зараз знаходиться на своєму місці як мер, і дуже багато гарного робить для киян". But if he should find himself so inclined, that will be quite a match, both for us and for him. Leonid Chernovetsky is right where he should be as mayor, and is doing a lot of good things for Kyivites. Oh yeah, he’s a miracle of a mayor for some. His vast experience in pre-election “loyalty programs” and post-election “land issues” makes him a precious asset for the Party of Regions. Birds of a feather flock together. Given the PRU’s modest local score of 11.76 percent in 2006, the partners could balance each other out. In exchange for taking Chernovetsky under its wing and securing him a seat in the Rada, the PRU will gain better access to Ukraine’s biggest municipal piggy bank. And if the movement for early mayor elections stumbles, allowing ChernoCo to continue doing all those “good things,” the partners will hit another jackpot. Or should we say proffessionals? A total of 152 people have been hospitalized following the Monday train accident, 47 of them children. A train carrying 15 tanks of liquid white phosphorus derailed near the western Ukrainian village of Ozhydiv, Lviv oblast. 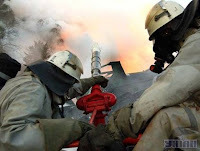 As a result, 6 tanks caught fire, releasing a toxic cloud that spread over an area of 35 sq miles. Residents of neighboring villages were evacuated, some of them using their own transportation. Vice-Premier Oleksandr Kuzmuk, chief coordinator of the relief effort, initially compared the disaster to Chernobyl, but soon toned down his estimates. While the accident stands no comparison with Chernobyl, a Soviet-style cover-up campaign of sorts may well be the case. 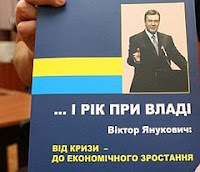 In the face of parliamentary elections, Mr. Yanukovych — the No.1 Proffessional — needs to have his anatomy covered. At what cost? According to a report quoted in UP, to contain the negative publicity, clean up crews are forbidden to wear respirators. It’s not so hard to believe, since former defense minister Kuzmuk, aka ‘Missile Man,’ has a proven record of experience in cover-up attempts. He denied role when, during a tactical missile exercise in 2000, a Tochka U hit a condo complex in Brovary, a town near Kyiv. In 2001, he was the last to take responsibility for accidentally shooting down a passenger plane in a Black Sea air defense exercise, which led to his resignation. Last month, the SBU issued a memo that warned of a 68 percent wear-and-tear rate in the country's train pool. The Kazakh company that produced the Poland-bound cargo has vowed to repatriate the remaining tanks along with the contaminated soil. The cause of the accident has yet to be determined. From media reports so far, it appears that investigators do not consider terrorism a top theory. Still Don’t Believe in Socialism? Socialism Starts at Home! Proletarians of all countries, check this out! Ukrayinska Pravda continues with its housing survey of Ukraine’s top-ranking public officials. 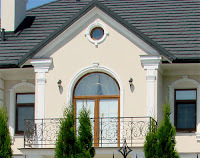 Its latest onsite inspection zeros in on the residence of Transport Minister Mykola Rudkovsky, a member of the Socialist Party. According to publicly available records, in 2006 his family lived on a household income of $30,000. It must have been a bad year, since the mansion’s market value may be as high $5 m. One may wonder, however, why this piece of real estate is totally missing from the records. Do the math: Once sighted in an Aston Martin — James Bond’s car of choice — Rudkovsky denied ownership of that luxury vehicle. UP remains hopeful that Minister Rudkovsky, who was not immediately available for comment, will share the secrets of his socialist success with the public. Ukrayinska Pravda posts the cover of his supposedly ghostwritten masterpiece. According to an earlier report, a copy was intended as a birthday present to the “author” himself. As you can see, the blue-yellow banner, which normally symbolizes the blue sky above yellow grain fields, is arranged a bit differently. They say a picture is worth a thousand words. For a book titled After a Year in Power: From Crisis to Economic Growth, that expression rings so true. Undoubtedly, it’s the picture that gives meaning to the words. This year’s edition of The Economist’s Big Mac Index has a lot to tell about Ukraine. 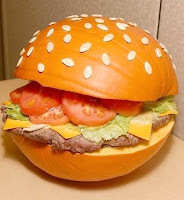 First published in 1986, the Index relies on the price the U.S. Big Mac as the benchmark for tracking the local prices of the world’s best known fast food item. By simple math, it calculates the purchasing power parity (PPP) for each country and compares it against each country’s official exchange rate. 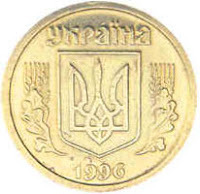 Still, Ukrainian economists have long considered the hryvnia’s undervaluation a fact of life. Ukraine’s rating of -47 (or -41 if we use more recent data) means that 2.77 hryvnia per U.S. dollar would be more accurate than today’s official exchange rate of 5.05. As the main beneficiary of this hefty discount, the ruling Party of Regions should partner with McDonald’s in integrating these mouthwatering financials into its parliamentary campaign menu. After all, PRU members top the ranks of those happy Ukrainians who cash in on the robust metal exports powered by a weak hryvnia. Тільки Віктор Янукович та Партія Регіонів довели, що вони мають досвід ефективно керувати урядом, що досягає результатів! Стабільність, ефективність, продуктивність - ось справжні лідерські якості, яких Україна потребує, щоб покласти край хаосу та знову стати на шлях розвитку! Only Viktor Yanukovych and the Party of Regions have a proven record of experience in efficient governance that delivers results! Stability, efficiency, productivity! These are the true leadership qualities that Ukraine needs in order to put a stop to the chaos and get back on the development track! Well, that’s hardly surprising since consultants to Yanukovych have a proven record of experience in catering to Philippine leaders. As “people all over Ukraine struggle to make both ends meet” — the truth championed in a recent Party of Regions ad — some people obviously defy the order of the day. Their luxury lifestyles know no end. 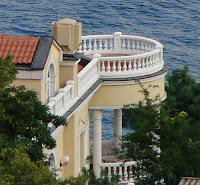 Ukrayinska Pravda takes a closer look at a privately-owned Black Sea summer house where Yanuk stops by. Breathtaking, isn’t it? In 2005, according to his publicly available tax returns, Yanukovych made 38,000 hryvnias, or $7,525. Had the guy not blown his cover, this information should have put international food relief organizations on alert. Check out Tymo’s residence, which she, in her own words, rents.